Flowing gowns in pastel colors, flawless skin, toga dresses, braids and plaids – I know you already understood whom I am talking about. Aren’t Greek women beautiful? Not that we are not, but the simplicity with elegance that they get, is just mesmerizing. And what could be most relieving than finding out such easy hairstyles to grab in just a minute or less. So, today, why not we consider them as Greek Goddesses and take some styling inspiration from them? To save you from the trouble going through magazines and cliché real time model inspirations that has hairstylist at job, here are Half-Up Half-Down Hairstyles you would love doing yourselves. Short hair is not a problem unless you know these flattering hairstyles to copy right now! Do we need any explanation to this Half-up Half-Down Hairstyles? Just start from the top and end it mid ways and let the rest of the hair loose. You do not need a lot of time also to be able to do this. You can start from the side, to add a slide twist to it. Comb your hair complete back. Now, take the left side of your hair, twist it all the way to the right and pin it up. Repeat the same from the right side to left and pin it up. Ensure both the twists are coming one below the other and you are done with this yet another Half-up Half-Down Hairstyles. Add small beads and Greek hair accessories to this. This is the regular waterfall styling, but this is going to be only in half side of your hair. You can choose right or left based on which side you want your hair to fall. This Half-up Half-Down Hairstyles suits best in a day old hair. This is the classiest Greek Goddess hairstyle. It is a combination of roll ups and buns and it makes the look extremely elegant. Leave the front portion of your hair and start braiding below your part. Go left to right and then right to left. This is enough, but if you want, you can add as many rope layers, as you want. 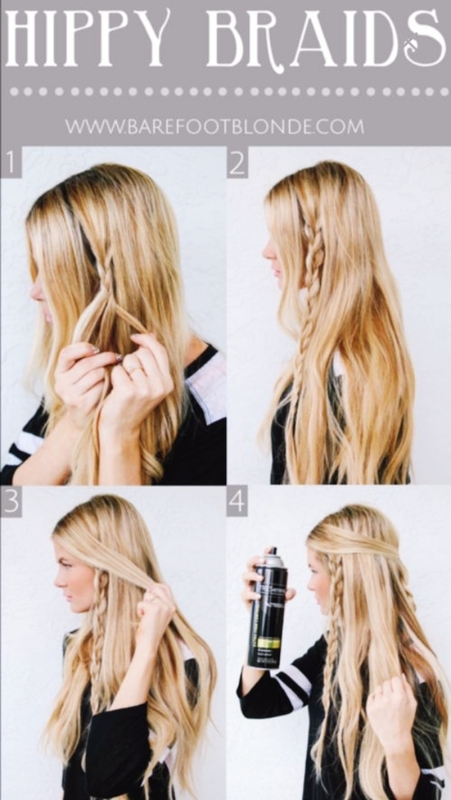 Take hair strands, both from each of the side and make a loop from the middle. Make a loop from one of the sides of the hair. Now, take the hair from the other side, and pull the hair under the lopped strand. Pull the rest of the hair down from the loop. Put that left over hair, again from the two loops made in order to tie the knots. Secure with bobby pins. How to correctly combine neckline and hairstyle is a mystery solved ages ago. READ! This Half-up Half-Down Hairstyles needs no introduction. This has been one of the best for all those lazy days of work. 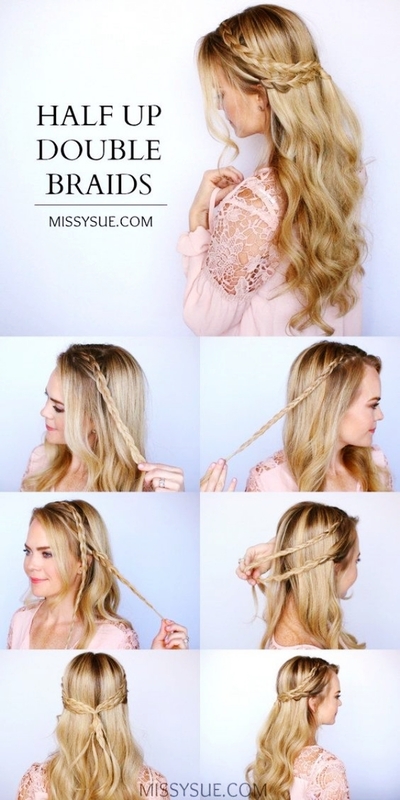 This messy half up do can either be in a messy bun or a messy braid – up to you. This is my personal favorite. It brings in that chic look and you can accessorize it with Greek hair accessories. Divide your hair into two and just how you make two big ponytails, make two side buns. If you are looking for Greek hairstyles for a wedding or a ball, then this is just perfect. Make that Disney bow at the back crown of your hair and let the rest of the hair loose. You can take small strands in the front and decorate the bun with white and silver hair beads. Take a small strand of your hair from near your ear, braid it completely and take it across your head to the left side like a hair band and secure it there. Repeat the same from left to right and tie it exactly near the pervious headband. Give a nice pouf to the crown section of your hair; by either back combing or adding that artificial pouf accessory. Now, just simply pin it up at the back and let it loose. Don’t tie it very tightly and let some strands fall deliberately. Greek goddesses and celebrities wore most of these Half-up Half-Down Hairstyles and they have carried it off with utmost elegance. You know the best part about this hair styling? They look good on all kinds of outfits – be it your look to beat those Monday blues or the party ready look.